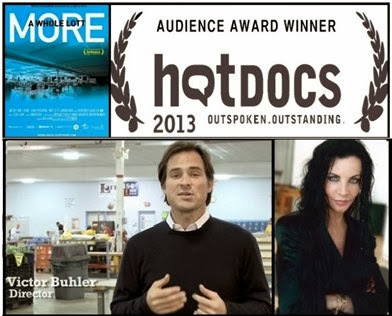 "We made this film to bring more awareness to employment issues for people with disabilities. In a tough economy, everyone worries about their job, their home and their children’s futures. With so much on our minds, is there even space to think about the 80% of Americans with developmental disabilities who remain unemployed?" On Monday, November 4, 2013, there will be a special screening of the acclaimed new documentary, "A Whole Lott More". SPECTACULAR "SEE WHAT YOU MISSED" FACEBOOK PHOTOS of the special screening "A Whole Lott More" ARE HERE! Yay! The film follows three individuals - each has a different attitude towards work and a different disability. It is an important film about an often ignored issue and powerfully brings to light how, for the good of all Americans, more people with disabilities must be included in the working world. The film recently debuted at the HotDocs film festival in Toronto. Loreen Arbus, Executive Producer of "A Whole Lott More," is hosting the screening. Also in attendance will be Victor Buhler, Director of “A Whole Lott More” and Joan Browne, Former President of Lott Industries. Victor Buhler, Loreen Arbus, and Joan Browne, who appears prominently in the film, will discuss the movie after the screening. Around eight million people in America have a developmental disability. Those who work often find jobs in ‘workplaces’ - coalitions of businesses and social service agencies that traditionally provide manufacturing jobs. In Toledo, Ohio, there is Lott Industries. For decades Lott Industries competed successfully for auto industry contracts, employing 1200 workers with disabilities. With the collapse of the local auto industry in neighboring Detroit, Lott has struggled to keep its doors open. The film looks at the impact of Lott’s struggles and examines the wider world of employment options for people with disabilities. Our documentary focuses on three unforgettable individuals – each with a different attitude towards work and each with a different disability. The film showcases their incredible resilience and makes the case for greater employment opportunities for all. We'll keep you informed so RSS feed this blog and visit frequently. Stay tuned for the exciting “See What You Missed” video of the event which will include special interviews. Photos courtesy James Grant PR and "A Whole Lott More."